Hey, you know those cappuccinos at the Starbucks around the corner? The ones you keep thinking about all day long? The ones you’d trade one of your kidneys just to sip on? Now, what if you could whip up one of this babies right in the comfort of your kitchen and take a ride to caffeine nirvana whenever you want? 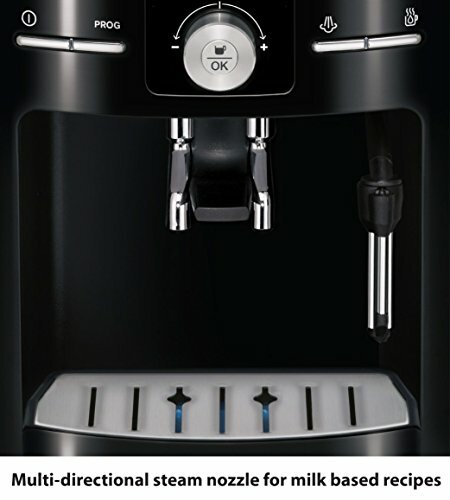 Well, the Krups EA8250 Espresseria Fully Automatic Espresso Machine was designed with exactly this in mind! This espresso machine takes the whole concept of super automatics and hits it with a punch of French sensibility. It promises to grind your beans, tamp the grounds automatically and pull a shot of espresso according to your specific settings. And all it requires is for you to push a couple of buttons, sit back, and scroll through the photos in your phone as you marvel at your beauty. All this freedom to indulge in vanity won’t come cheap though; this particular KRUPS goes for a pretty significant $500. But is it worth the green? Let's put it to the test! We’ll be honest. The beauty of this machine will make you have butterflies in your tummy! The Espresseria is finished in a shade of black that is simply stunning. Disappointingly though, the exterior isn’t stainless steel as you’d expect from a machine at this price point, instead being sturdy plastic that is fashioned to look like stainless steel. But despite that, it still feels sturdily built, with a respectable weight of 10.4 pounds. If you have a crammed kitchen, you’ll do back flips of in joy once you see the compact size on this beauty. Measuring 11.5 x 8 x 12.5 inches, you won’t have any problems finding counter space for it. But don’t think for a minute that functionality has been compromised for size. 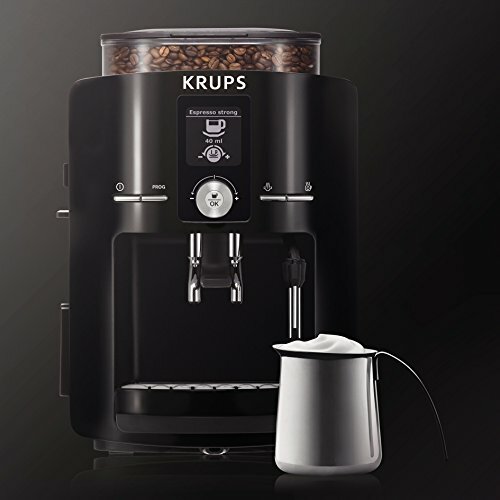 Almost miraculously, KRUPS has managed to fit a 60oz water tank, a 0.6lb bean hopper, a conical burr grinder, and 15-bar pump. There is even a slot near the back where a user guide has been conveniently inserted. Now, that’s what you call space economy! Unlike its counterparts like the DeLonghi ESAM3300 Magnifica, the Espresseria doesn’t come packing dual boilers. But that doesn’t seem to slow it down! 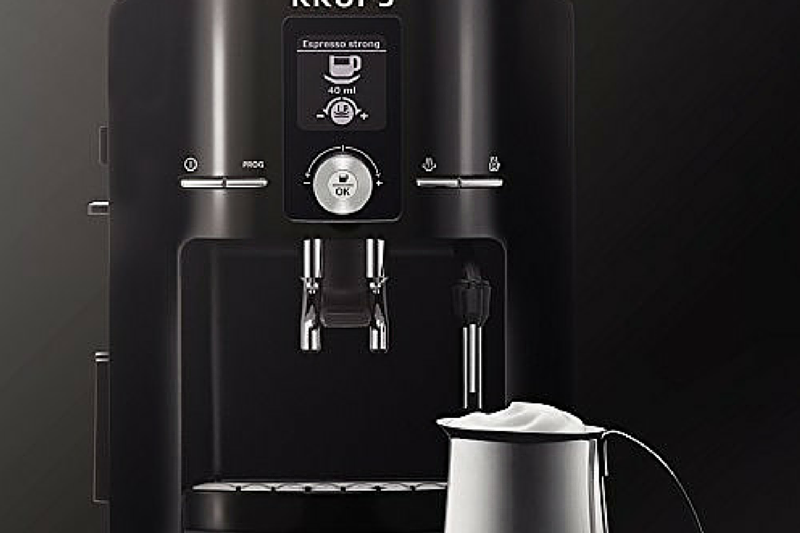 It still manages to whip up piping hot cups of java courtesy of a Thermoblock System that KRUPS is determined to keep a secret. Whatever wizardry they use, our taste buds truly thank them. This might probably be the most exciting part about using this machine. The beautiful LCD panel coupled by a series of buttons and a control knob, makes operating this bad boy a total breeze. 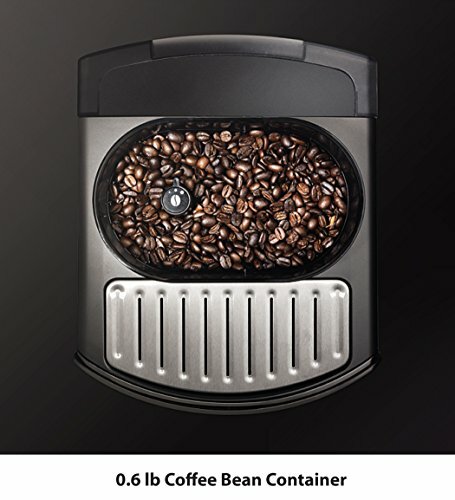 From here, you have the option of customizing your coffee type,water hardness, and even the temperature of your joe. You can also tweak with the auto-off feature to trigger with in half an hour to four hours. There is even an auto-on feature somewhere in there, but the machine still requires you to hit the brew button for things to get started; a bit of a bummer. If you love those creamy cafe lattes, you’ll most certainly get a kick out of the insanely effective steam nozzle. And get this, the Espresseria actually comes with its own stainless steel milk container! So you don’t need to cough up another 100 bucks for one of these. But while the nozzle foams milk like a dream, it’sa bit rigid making it hard to get a hang of. Maybe it should try yoga? Like it belongs on the Jetsons! Just like its name suggests, this fully automatic needs very little of your intervention to churn out those cups of gold. All you have to do is ensure the tank and bean hopper are filled, key in some settings, and watch technology do its thing; aided by some pretty intelligent design. 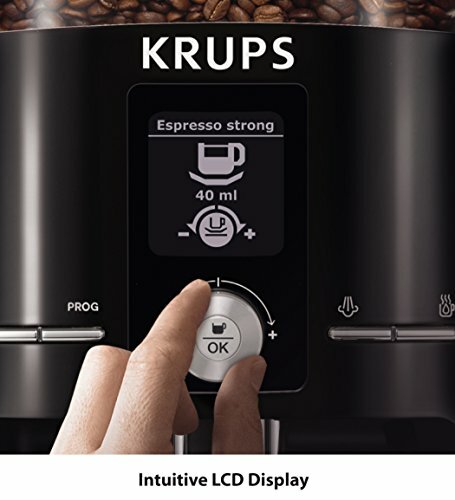 That Thermoblock System is definitely a force to reckon with, because the KRUPS manages to pull a shot of espresso in less than 2 minutes. Yup,a mere 120 seconds! Thant's staggering. And not just any shot of espresso; piping hot one. So if you’re a fan of java that tastes like it was brewed in a volcano, you’re in luck. 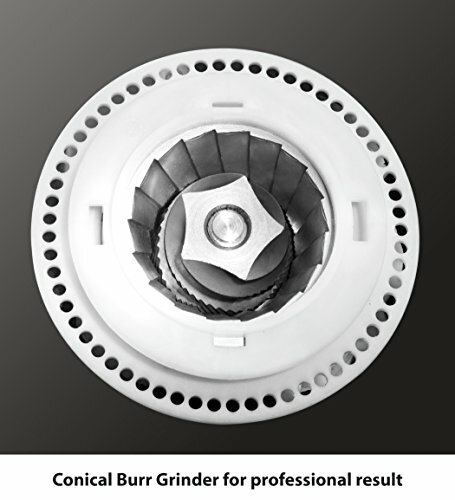 While the integrated burr grinder doesn’t sound like a sweet whisper, it isn’t wake-up-the-neighbors loud either. You can actually have a conversation right next to it, and the other person will hear every word about how you’re cooler than them because you own an Espresseria. The grinder also gets major points for being unwaveringly reliable no matter what beans you throw at it. The non-removable bean hopper is a bit of a let down though, because you’re forced to run through all the beans in there before you can sample a different blend. This might be in an effort to further preserve the freshness, but it also manages to make you throw around a curse word or two. It also doesn’t give you the option of using pre-ground coffee, but if a bypass doser is truly dear to you, then machines like the DeLonghi Magnifica will give you just this. For those of you who hate cleaning more than the Third Reich, this espresso machine will make you sing out in happiness. It only requires cleaning after about 360 cycles, with majority of it being fully automated. And it’s pretty snappy at getting spick and span too, with the average cycle taking just 22 minutes. Maintaining this machine is not the cheapest thing though, with you being required to change the water filter every two or so months.And at $18-20 a pop, the numbers quickly add up. But you can save some change by directly using filtered water instead. Beautiful and intuitive user interface. Hot and great tasting coffee. Doesn't have a bypass doser. Steep price and maintenance cost. Like most super automatics, you need to stay away from dark Italian and French roasts owing to their oiliness. Opt for medium roasts that won’t lead to a bitter brew. The cup clearance is enough to accommodate a decently-sized mug, but if you’re using a rather tall cup, all you need to do is slide out the drip tray, and presto! If cleaning isn’t you thing, skip using the included milk accessory and froth cup by cup. This will lead to a happier and more peaceful existence. 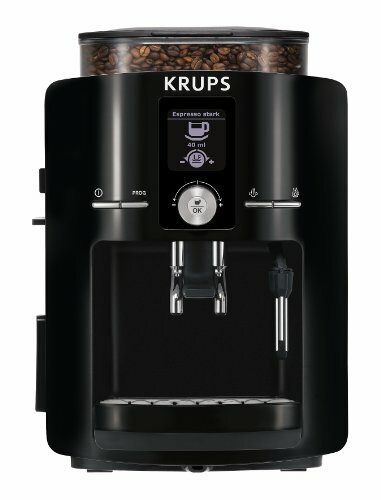 TheKRUPS EA8250 is billed as an all-in-one espresso machine, and this actually rings true. You can pull a heavenly shot of espresso, brew some coffee, enjoy a latte, or even get hot water for your tea or chocolate. And it manages to all this without requiring you to use significant brain power; perfect for those early mornings. It might not have some of the advanced features of its expensive counterparts, but what it lacks in tech, it more than makes up for in striking looks, simple usability and coffee that will make your taste buds do a standing ovation.